Hortinet is an integrated traceability system developed by APEDA for providing Internet based electronic services to the stakeholders for facilitating farm registration, testing and certification of Grape, Pomegranate and Vegetables for export from India to the European Union in compliance with standards. To harness the potential of mobile technology, APEDA has developed a mobile app to allow farmers to apply on-line to facilitate their farm registration, tracking the status of application & approvals by State Government and Lab sampling by authorized Laboratories. This mobile app initiative is expected to increase the accessibility and reach of the Traceability software system among the farmers and other stakeholders. Dr Tarun Bajaj, GM APEDA initiated the proceedings by outlining the new mobile app concept and its evolution . Chairman, APEDA, Shri DK Singh welcomed the dignitaries and then addressed the gathering . He mentioned the various initiatives taken by APEDAin the past like introduction of TraceNet for organics, AnarNet , GrapeNet traceability softwares . He cited the importance of the new mobile App Farmer Connect which is a giant leap in connecting the farmers through mobile network for registration procedure at his comfort from any location. He also mentioned that through this App not only the process of farmer and farm registration will be convenience but laboratory testing of product samples will also be easier. The three dots in the App logo signify the farmers, state government and the laboratory which is the essence of this Farmer Connect App. He also mentioned that this app is being launched in Hindi and Marathi apart from English so that it becomes user friendly. Shri Sumanta Chaudhary, MD, SFAC appreciated the new mobile app and highlighted the areas of mutual cooperation between SFAC and APEDA through networking of clusters of FPOs and APEDA clusters . 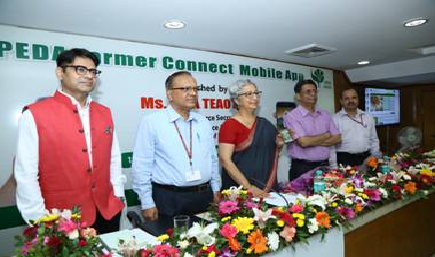 Commerce Secretary , Government of India, Smt Rita Teaotia launched the app. The occasion was followed by display of a film depicting all the facets of the utility of the new app. Addressing the gathering, the Commerce Secretary expressed her happiness at meeting the APEDA family. She mentioned that Indian agriculture exports are worth 34 bn USD in the total merchandize exports of 435 bn USD. The level of agricultural exports is low considering that we have enormous population and most of what is produced is consumed domestically. Though we have only 2.2% share ,yet we are amongst the top 10 players in global agricultural trade. The efforts made by APEDA in promoting exports especially the use of traceability softwares has benefitted Indian agricultural trade and ensuring that importing countries get the product of quality and standards that they desire. It is true that there could always be stray cases of failure of samples which could have repercussions on the farmers . It is important for us to make best use of technology so that any problems areas are tracked and solutions found . The use of mobile app technology and traceability systems is a great tool in identifying the farmers and laboratories from where the produce was sourced and tested . She advised that APEDA make all out efforts in enrolling larger number of farmers and exporters through the new technology tool . Commerce Secretary mentioned that there is need to move towards adoption of similar standards for domestic market and export market since the Indian consumer is also expecting and entitled to the best quality product. She suggested that the Mobile App be also be made available on IOS system apart from Android and that the app and other traceability systems should be made in vernacular languages for better understanding by users. Mrs Rekha Mehta, AGM, APEDA then tendered the Vote of Thanks. Please visit http://apeda.gov.in/apedawebsite/Grapenet/Hortinet.htm to download “APEDA Farmer Connect” app.